Hans, who is an architect, lives in Berlin. Marike, whom Hans knows well, is an interior decorator. Marike has a dog which follows her everywhere. That: used for humans, animals and things, in subject or object position (but see below): Marike is decorating a house that Hans designed. Whose: used for humans, animalsi or objects to give information about their possessions. The girl whose dress is red is my best friend. The hotel where we stayed last summer was very beautiful. My baby was born in the year when I moved to Italy. Ataturk , who was the greatest leader of all times , created a modern country from the ashes of Ottoman Empire. The desk in the corner , which is covered in books , is mine. Be careful!!! : non-defining clauses are usually separated by commas. “that” is not usually used in this kind of context. The package that arrived this morning is on the desk. (We need this information in order to understand the sentence. Without the relative clause, we don’t know which package is being referred to. Be careful!!! “that” is often used in defining relative clauses, and they are not separated by commas. 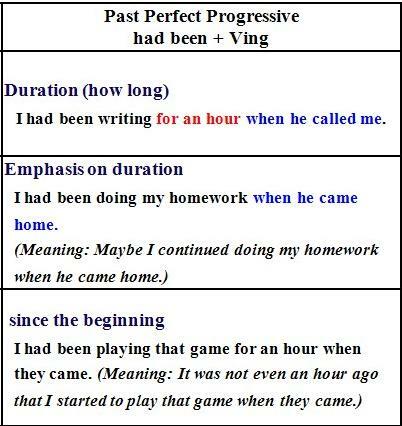 The past perfect is used to refer to an event or situation which took place before another past event. Tom had interviewed five times before he got his first job. She had already eaten by the time they arrived. The past perfect continuous is used to express how long something had been going on before something important happened in the past. Jane had been studying for four hours when he came home. Jack had been driving four over six hours when he finally pulled over to have lunch. Note: You cannot use non-action verbs in past perfect progressive tense.